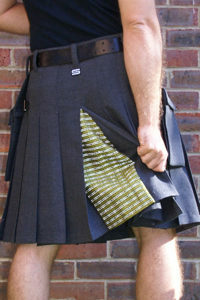 I’m very interested in your Classic Grey flannel kilt with Yellow Raver Dashing Tweed. Is this model still available and if so, could it be ordered with at least a 23 – 24.5 length? Also, can this kilt be worn while hiking/backpacking? It’s the Grey Flannel combined with the Yellow Raver Dashing tweed that has me sold! Don’t think I could settle for anything less, just hoping I can use it hiking as well as around town and for work! You have good taste – that is a mighty fine Skilt. The yellow raver fabric I can re-order. The grey flannel is, sadly, all gone. How about the yellow raver with the charcoal grey chalk / pin stripe? Thanks for the quick reply. There’s just something about that grey flannel that really sets it apart from all the other fabrics and quite frankly from all other kilts currently on the market. Any chance of that ever coming back? If I have to wait, then I’ll most certainly do so even if it means waiting years to get that Skilt in the grey flannel and yellow raver tweed. I’ll wait for as long as it takes, Richard! However, the sooner the better!